Peanut butter pancakes are the perfect breakfast. As you hit each P and B sound, you should have felt a blast of warm air on your hand. If you didn’t, press two fingers against your neck, right next to your windpipe, and check for a pulse. Another air issue can be demonstrated by making a long S or F sound: Sssssssssss and Fffffffffffffff. We make these noises by forcing air past our teeth and lips, shaping them with our tongues. This is called ‘sibilance’. These sounds are some of the most common things that separate amateur and professional recordings, and there are some pretty easy fixes! Here are a few of the techniques that are available. Look how much fun Paul is having with his pop filter. You’ve probably seen one of these before. It’s essentially a plastic circle with nylon stretched across it, that clips onto the microphone stand, and sits a few inches between your mouth and the microphone itself. 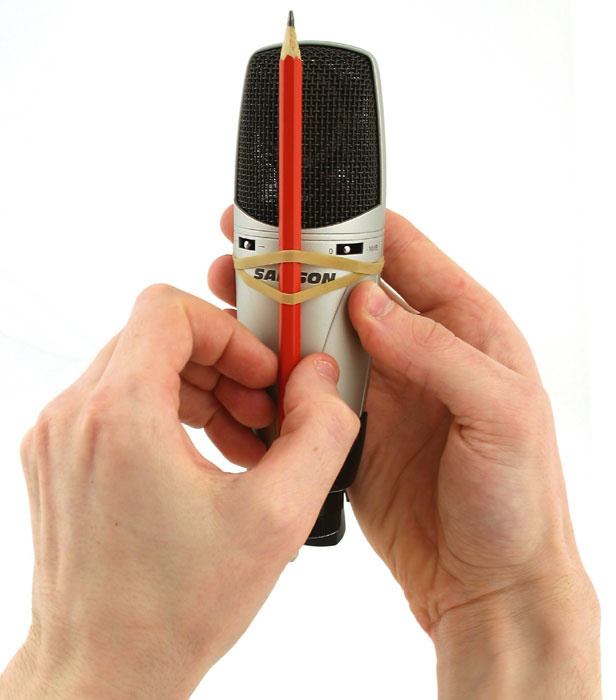 This catches and breaks up the puff of air before it reaches the diaphragm of the mic. They’re pretty affordable, but if you’re on a budget or in a hurry, you can find some tutorials to make your own out of a metal clothes hanger and your mother’s pantyhose! Ask her permission first, unless you’re an adult and the two of you have a toxic relationship – in which case, this is the perfect way to stick it to her! This is a foam ball that covers the top of the microphone. These work well for live settings, but typically, you’ll still want to use a pop filter in the studio, depending on how close you’re singing into the mic. These are also pretty inexpensive, and usually come in packs of five or more. This is a plug-in that comes with most recording programs. It works by limiting the amount of sibilant sounds in the 2-10 kHz range, which is where those blasts of Ess, Eff, Tee, Shh, Thh, and Zz air lie, in terms of frequency. These are a great tool for quick cleanup, but they won’t always eliminate the problem entirely. It’s a good idea to double up on some of these techniques. This is the easiest of any technique. Face your mouth directly at the front of your microphone. Now turn your entire body, including your mouth, just a few degrees to the left or right, so you’ll be singing at the side of the mic, rather than at the center. Imagine the mic has an ear on each side of its head, and you want to sing at one of those ears, rather than at its nose. This will eliminate most pops and sibilance, but depending on the type of microphone you’re using, you might get some weird directional effects. Try it out, and see if your mic does a good job of picking up sounds off-axis. experience, this works almost as well as a professional pop filter, more with sibilance than pops. Got any tricks that you’ve used? Let us know!